An easy drive into town, not the long speeding drive of Varanasi, the taxi took me pretty much to the doorstep, no easy feat in the old towns of India where ancient roads are too narrow for cars. I say nearly, it’s about three minutes walk up a winding path to where I am staying, with scooters and motorbikes whizzing by. I could have opted for one of the well-known five and seven star hotels, but I’m not quite the millionaire yet. Instead, I chose an AirBnB home stay. I have my own little studio rented from a woman who goes by Rosie. It is a charming, quaint studio, the sort of place you want to stay for a month at a time, packing your typewriter so you can focus on that novel you’ve been meaning to write all these years. The courtyard is small, the doors are thick wooden doors in the antique Indian style; a padlock keeps you and your belongings secure. Inside the studio is decorated with all the lovely charm of rustic Indian with European aesthetic and taste. A sturdy rocking chair by the door, perfect for connecting to the wifi in the morning and organising your day. The walls display a collection of Hindi gods framed in unassuming frames, charming wood and mirrored wall hangings each with a tiny box, and a set of six 100 year old antique Udaipur postcards – something that Rosie later sells me for a fair price. 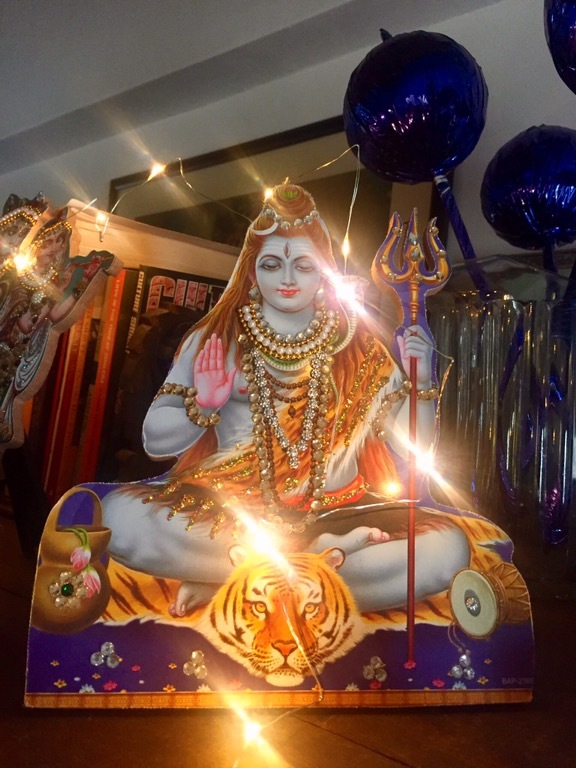 Atop the armoire kitsch crafts adorned with rhinestones, figurines of the well-known Hindu gods in various poses, a string of lights weaved in between, all giving in to the festive Diwali season. The nooks hold a collection of books you can thumb through if you find yourself in need of reading material. Bamboo beamed ceilings evoke the comfort of simple homey style where at night you feel cozy in the cocoon like setting. This is the place I have come to relax this long four day weekend, to escape hectic and polluted Delhi. This is the Indian experience I am in need of. 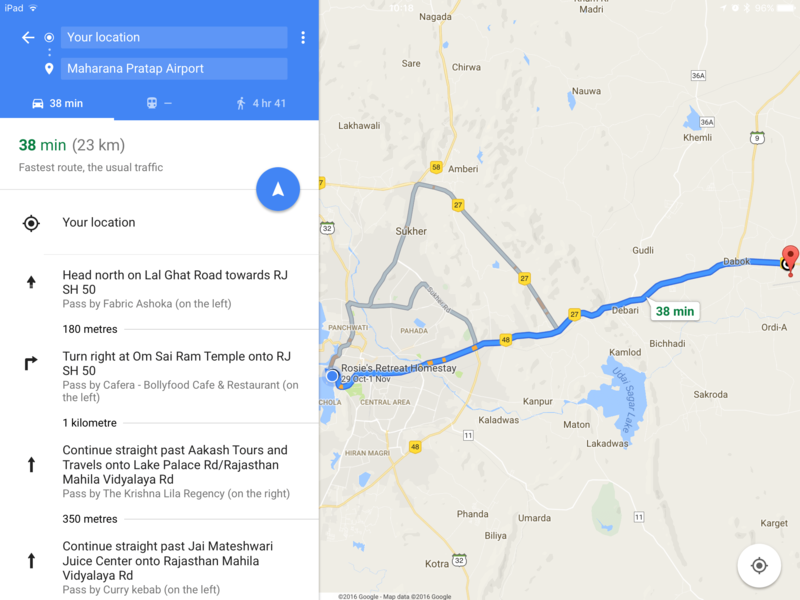 Rosie is a middle aged British woman who tells me she’s been living in Udaipur the last 15 years. Everyone is “Darling” to Rosie. She does not appear to identify with her English roots although her accent gives her away. Wearing her long hair down, framing a slender face, she dresses in the casual cotton Kurtis; she does not seem to be the type to adorn a Dupatta. I personally find Dupattas the most attractive part to the daily famale Indian attire, they are what attracts me to buying my outfits. From a small town in Somerset she tells me, we both speak about the challenges of staying in touch with friends and relatives back home. Life’s twists and turns are more pronounced outside your home country, while those you are close to back home seemingly stay still. Many of my New York friends are still doing what they have been doing since their 20s – from afar New York is not that dissimilar from any small town in America. On some level Rosie has the lifestyle I aspire too, just maybe not in India. A bed and breakfast, something you can retire to, meeting new people as they come and go. Self-sufficient, providing one with the flexibility to be yourself, something that is increasingly difficult to do in the global corporate confine unless of course that is who you are. She is very knowledgeable and shares her tips quite generously. I get the sense she rarely returns home, keeping another house in Transylvania. Named a magical house because the furniture moves on its own she tells me. Not bothered by the poltergeist, she purchased the cottage and has been restoring it for the last nine years or so. Rosie is genuine to the core, peppered with her personal story she shares which shops to avoid and which restaurants to try, just the sort of guidance one seeks when in a new town, in a foreign country. The City Palace is the main attraction in Udaipur. It’s massive, something like 11 separate palaces added on over time from one Maharaja to another. On the outside you get a sense of what it must have been to live in the aristocratic Indian past. More or less on the waterfront overlooking Lake Pichola and the white washed Taj hotel in the center of the lake, one of the high end hotels in the city. 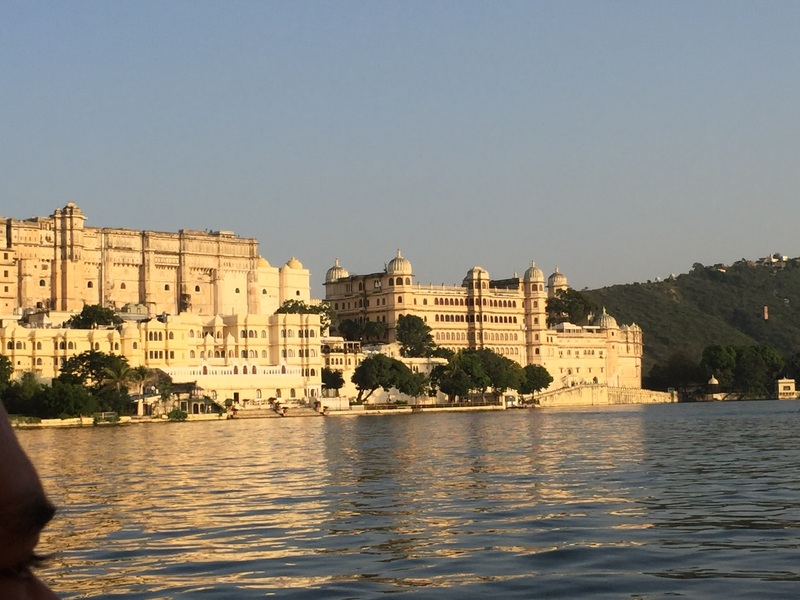 Seemingly well maintained from the outside, the City Palace offers various tourism packages – a boat ride on the lake to Jagmandir, a little island with a mini palace and cafe offering scenic view of the town, or a bit of a waltz through the palace itself. Strolling into the palace the grander seems to slip away somewhat. Meandering from wing to wing, what is on display is a poorly kept collection of dusty relics – not all of which antique. A few beaten down floor pillows, faux furniture and cutouts of the Maharajas who once inhabited the dwellings. I did not see any photos of the Maharanis however, even in the Zeena, or woman’s palace. This is an exhibition for the masses, the real jewels are either long gone or hidden far away from the tourists who come to glimpse the royal past of this grand family. The palace does not look so grand as it does old and crumbling. The current Maharaja lives in the palace, apparently contested for the meaningless title and control of the palace hotels by his older brother since the mid 80s. I glimpse him and the family as they are ushered back from the Diwali festival in a caravan of SUVs, full regalia of headdress for the men, and for the women red and gold saris. Leaving the palace, I walk down City Palace Road, past Jagdish Temple. A woman approaches me saying what I think is “Miss Rupees” but in hindsight it might have been more of a question, “Miss, rupees?” I politely offer a “Namaste, happy Diwali” and keep walking. The city is small, but its winding streets provide you with hours of sightseeing. So much people, and animal, watching. The thresholds of shops and homes are painted with welcoming decorations. It’s a colourful place to explore. 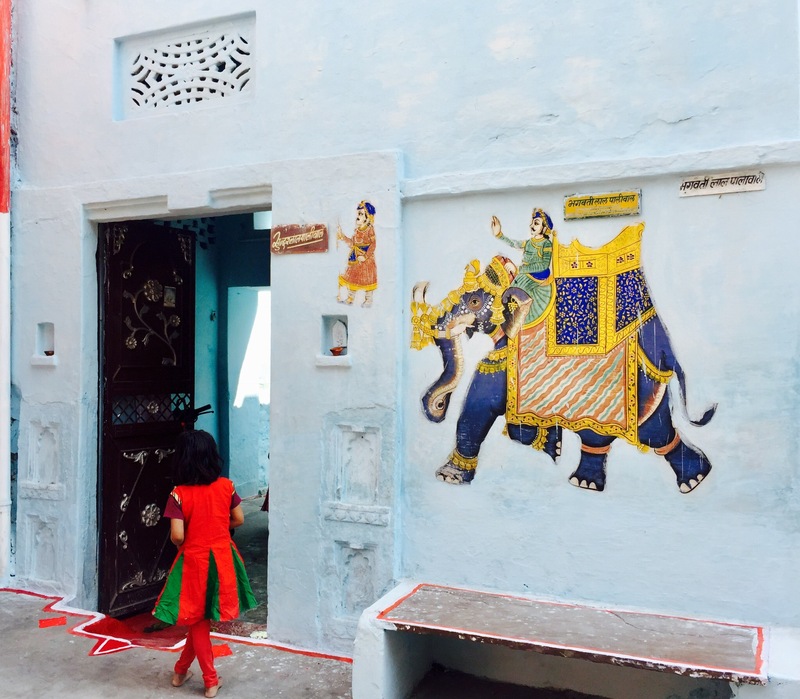 Even the walls are not forgotten, adorned with tiny murals of an Indian pastime, elephants, men with swords, women seemingly poised in a dance with their lovely saris flowing around them. Some are even decorated with mirrored mosaics which the sunlight flickers on. The unknown artists who painted them, not asking for money or recognition, just that their work is appreciated. No names are added to the murals, the act of offering their art in a selfless act.